Kyoto is famous for having been the ancient capital of Japan, dating back over 1200 years.The sheer beauty of the temples, shrines, gardens and culture imbued within, makes Kyoto one of the most revered places in Japan. Momiji-an is one unit of Kyo Machiya Miyabi in Kiyomizu area, a big Kyoto traditional house, and was designed and divided in three machiya (Bairin-an, Shofu-an, Momiji-an) by renowned Kyoto based architect, Geoffrey P. Moussas. Momiji-an is being meticulously preserved with the traditional techniques that have been handed down over the centuries. While sticking to tradition is important for the architect, updating the facilities, such as modern bath-shower room, high-tech toilet, kitchen, heating floor, are just as important to meet the present day needs of our selective clientele. The delicate balance between 'old and new' is what sets this apart. Momiji-an is at the foot of Kiyomizu Temple, which is been designed a World Cultural Heritage, and very convenient to visit others famous temples, shrines, and Gion, the most famous Geisha district! Enjoy Kyoto and the distinctive feautures of local townhomes by staying in a real Machiya, feeling the natural way of living and the change of seasons which distinguishes Kyoto' culture and its people. City buses or rental bikes can take you to most famous sites in Kyoto within 30 minutes. Please see our other 2 listings in the same place:Shofu-an VRBO#438156 & Momiji-an VRBO#438158. In Sanjo-Kamanza area other 2 listings: Shimoza-an VRBO#514790 & Kamiza-an VRBO#51458o within 30 minutes. In Aneyakoji area other 2 listings: Kaede VRBO#1077968 & Satsuki VRBO#1077956. Kyoto is waiting for you! US$ rates for reference only. ※ When you check in, please pay accommodation tax of Kyoto government. This accommodation tax is not included in rental cost of the house. Please pay by cash. The tax fee is depends on how much you payed for your rental cost. If your rental cost is under 20000 JPY per person per night, the tax is 200 JPY per person per night. If your rental cost is 20000 JPY to 49,999 JPY per person per night, the tax is 500 JPY per person per night. ※Check in time is 4 PM to 8 PM. Leaving luggage before check in time (after 11:30 am) is available, please feel free to ask us if you need it. ※Please let us know the number of people correctly. If the number of people is different from the number you actually book with, we will charge you extra. Person not registrated for accommodation must refrain from staying overnight in the room. Please feel free to ask to us for any questions. Hello, everyone! We are 4 girls who live in Kyoto and Osaka! Shiho: I was a professional skier in Japan and Canada. I love playing all kinds of sports and drinking with girls' friend. We sometimes go to have dinner together. On my day off, I travel and explore in Kyoto. Jacky:I have been to Australia, New Zealand and Hawaii. I stadied English in Australia, so my accennt is a little bit Aussie accent. I love traveling, reading books, comics, watching animation of Ghibli,talking with my guests and sharing my life in Kyoto. Mia: I LOVE traveling, have been to over 10 countries and many places in Japan :) I also like walking along the river and relaxing on my day off. I'm looking forward to meeting you in Kyoto! Please feel free to contact us anytime! We could see a glitter of traditional atmosphere on the roof, wooden pillars, sliding doors or small gardens inside the house. The townhouse is called Machiya and this house strongly stimulated us to restore for living. Machiya used to be townhouses or shops for the merchants in the 17 th century. Not only temples and shrines, but machiya stay is an attractive experience for all who want to know more about Kyoto ' life style and its culture. A 15 minutes walk will take you to the riverside of the Kamogawa. You can take a pleasent stroll along the river, or do shopping in the nearby Kawaramachi area, convenient during rainy days as the shopping streets are covered, like Nishiki food market street. A night life spot is Pontocho, a narrow lane with no cars, full of elegant restaurants, bars, and where you can have a glimpse of a Geisha or Maiko on the way or from an appointment. Next street west of Pontocho is Kiyamachi, a very lively night zone where you can find many kinds of restaurants, bars, pubs and more... Enjoy Kyoto just walking from Momiji-an! There is a house phone in the house. You can call us if you have any question or if you are in trouble. Great location, perfectly clean, love the traditional feel of the place...amazing staff! Wonderful, wish we could have stayed longer. Love the house, location and the staff...Jackey, Tommy...everyone was great and so helpful and accomodating. I would most definitely recommend this place to anyone visiting Kyoto. Thank you very much for such a lovely review! If our staff made your stay comfortable,and you really enjoyed our house and kyoto, that is our pleasure. I surely hope seeing you again! Great location, very friendly and clean. I had a great stay here! We loved our stay at Momiji-an. It is a beautifully renovated traditional Japanese house in a historic part of Kyoto, near to the Higashiyama heritage trail and close to Gion. The bedroom is exquisite and the bathroom is fabulous. Mariko was a wonderful extra mile host, picking us up and dropping us off at the station, as well as booking restaurants and organising access to the Moss Temple. We look forward to staying in this very charming place again, as soon as possible! A great place to stay in beautiful Kyoto! We had a great time in this Kyoto apartment. Its location is superb, only a two minute walk west to Higashi Oji Dori street where there are lots of buses and taxis. There is a Fresco grocery store about 5 minutes walk north on this street, and lots of restaurants too. The Matsubara-dori tourist street which leads to more restaurants and the Kiyomizu-dera temple is only a two minute walk to the north. 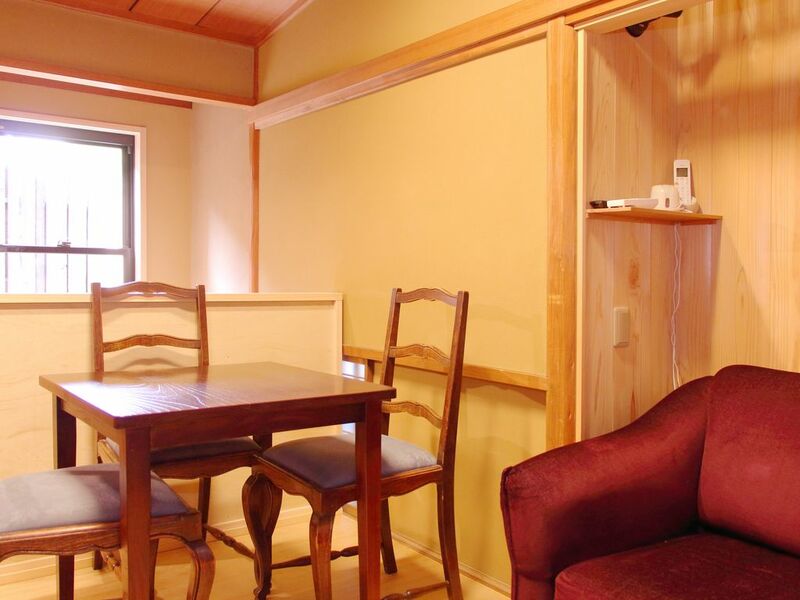 The apartment is perfectly located as a base to explore the southern Higashiyama temple district, and is a 30 minute walk from central/downtown Kyoto. It is also handy for the Gion teahouse/geisha district. The area is quiet and we slept well every night. It was great to come back here to recharge after a long day of walking in Kyoto. The apartment itself is a little small by western standards, but this is pretty typical for Japan. It is set back from the street and is quite secluded. The kitchen is small but very functional, there is a small sink and one-ring induction cooking ring. The microwave also functions as a small oven, which is very useful. There is a small fridge which is perfectly fine. The bathroom is excellent, there is a heated floor with big bath and a shower, and lots of natural light; it is screened very well from the outside. There is a washing machine/dryer too which is very useful. The bedroom is upstairs, and it is a lovely traditional Japanese bedroom, and there is lots of light in the morning. The floor is tatami mats and the beds are futons with single quilts. The living room is a good size, it has a heated floor and lots of storage space, with a small dining table and 4 chairs. The sofa is comfortable. There is a ‘vertical garden’ outside the window. The room is a little dark in the daytime, but there is good artificial lighting. A really unique feature of this place is that our hosts were so very kind. They picked us up from Kyoto station, checked on us to make sure we were doing OK, and then picked us up again and took us back to the station. This is a great service, it was very much appreciated! In summary, we stayed here for 4 nights and really enjoyed our stay. We would recommend this to others, and would stay here again. Thanks to Yumi and Mariko for taking care of us! Clean, comfortable and spacious. Love the bathroom! Appreciate being able to stay in a traditional styled home right in old Kyoto, so near Kiyomizudera and the other amazing spots. Other plus about location is supermarket within walking distance and great coffee (% Arabica) just 1 street away. Mariko was very welcoming and very helpful! This little jewel of a place was a delight from the bamboo lined path entrance to the comfortable futon bedroom, adorned traditionally with fresh flowers and Japanese scroll. The cosy kitchen and living area were well equipped , even sporting a coffee machine and coffee pods, (most welcome)and the bathroom complete with bath, set in a garden but safe from the weather was especially nice . Mario was very welcoming and available for all queries and topped off with being in the perfect location for good food, the old quarter of Gion and the temples nearby as well as a very handy bus stop made our stay here a unique and enjoyable experience. Sanjusangendo the temple of 1001 wooden statues of Buddhist Goddess.. There are over 800 temples and shrines in Kyoto!